The main benefits of hiking in the National Park vs in one many wilderness areas around Hetta is that the Park is dotted with well marked trails which lead, via bookable and open huts (to rest or sleep in every c. 10km), through the most beautiful areas, whereas the wilderness area trails are only for navigational experts. Please note, however, that the weather in the fells can still change rapidly and in the case of an accident help is far away. More information about the Pallas-Yllästunturi National Park and the activities permitted in it, the areas which are more restricted, etc, can be found in our 'location and area attractions' pages. 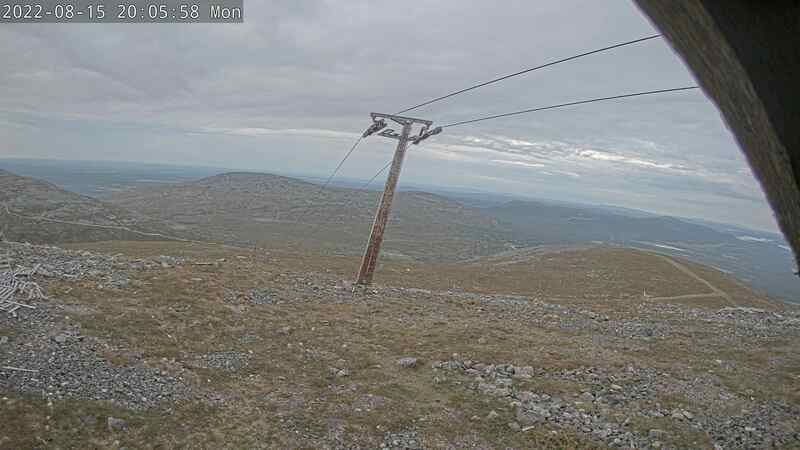 If you want to see what the weather is like in the Pallas end of the park, check out the weathercam. It is important to remember, for instance, that dogs are not allowed in any of the bookable wilderness huts and they are only allowed in the open huts if others who also happen to be staying there at that time agree. Hence, dog owners should bring a tent to camp in if they want to camp in a specific place or be willing to move further in search of an appropriate hut. In summary, Pallas-Yllästunturi National Park is Finland’s third largest National Park. The highest fell in this chain is Taivaskero, at 807m and the forests within the park are a mix of northern and southern species since geologically, the park is located between Northern Finland, Forest Lapland and Fell Lapland, making it a very varied and interesting habitat. Along its length, peoples livelihoods also change from farming to reindeer husbandry. One of the most popular hiking routes in Pallas-Yllästunturi National Park is the 55-km-long Hetta-Pallas Hiking Trail which was outlined, already, in 1934. NB: You can even run this route in a few hours if you take part in the 55km/1800m of ascent Hetta Pallas Ultratrail Run at the end of July. We are happy to arrange car transfers from one end to the other (€65 per transfer) or even to guide you on the journey itself. The best time for hiking is late June - mid October and the trail can be travelled from south to north or from north to south, starting and ending either in Hetta Village or Pallastunturi Visitor Centre. At the Hetta end, hikers must start / finish by crossing Lake Ounasjärvi by boat (or taking a long track detour around the lake). When coming to the lake from the direction of Pallas, there is a signal flag that can be raised to indicate that you need a boat transfer - but a working mobile phone with which to call one of the numbers listed, is a better bet! When travelling South from Hetta, the first (open) huts are at Pyhäkero. The next major stopping points are Sioskuru, Hannukuru and Nammalakuru, all of which have both open and bookable huts. Between Sioskuru and Hannukuru there is an open hut just off the track at Tappuri and another at Pahakuru and between Hannukuru and Nammalakuru there is an open kota and then an open sleepable-in hut at Montellin Maja. There is also an open hut at Rautuoja. There are periodically open wilderness cafes at both Pyhäkero and c. 10km from Pallas and in both Hetta and Pallas there are interesting nature centres with exhibits and films on the nature of the area. This is a beautiful, fairly steep 5km trail starts from a private road (at Vuontispirtti) and leads into the National Park, to a small, very old cabin, the Montelli open wilderness hut, nestled in the middle of the fells. It is probably one of the most beautiful spots in the National Park and is also accessible in winter by a ski track. You can connect from this trail to the main Hetta-Pallas trail by following white crosses. Near the timber line the markings of the trail change to short poles with orange tops. This trail leads up from the old ferry-stop at Ketomella on old boardwalks to the Sami reindeer marking village of Tappuri. It is a fairly flat trail with easy walking although the old rickedy boardwalks are in the process of being replaced with a more permanent duckwalk. Once at Tappuri, you are up amongst the high fells amidst stunning landscape. You can connect from this trail to the main Hetta-Pallas trail c. 1 km west of Tappuri open wilderness hut. The trail is managed by the Finnish Road Administration and it is marked with green poles with white cross signs with a red centre. It is c. 9km from Ketomella to the Hetta - Pallas Trail junction. Maintenance support for the 10km Pippovuoman wetland nature trail from the roadhead at Ketomella service, unfortunately terminated in 2014. This is a beautiful marshland trail, however, featuring unique aapa bogs, with dramatic fell scenery to the west, so if you are agile, it is still recommended before the boardwalks become too dangerous. In future, people will be redirected towards Pippoharjulta Hietajärvi, which has also got a new shelter. The trail starts 0.5 miles from Ketomella on the south side of the bridge. The 3.5km Pyhäjoki Nature Trail is a small but very beautiful trail alongside the steep, alpine-style stream that descends from the fells to the Pallasjarvi lake through some steep cliffs. Vegetation around the stream grows thickly and includes lush groves of old growth fir trees so the scenery is fairly different from the normal rugged Lapland scenery and is well worth a visit. This pretty trail begins on the Pallas Road, near the shore of Lake Pallasjärvi, at St. Joe's parking lot. The trail is marked with cone signs. The 9km circular Taivaskero route which goes to the top of Taivaskero takes c. three hours to hike. Taivaskero is 4km from and c.340m higher than the Pallas Visitor Centre. This 7km circular 'Palkaskeron' trail climbs to a high rocky point on the fells where, although many before you have left behind cairns, the national park authorities would hope that you would be able to resist adding more since it goes against the aims of conserving the national park in its natural state. This trail branches off from the Hetta-Pallas route, a few miles north of the Pallas Visitor Centre and can cause confusion in bad conditions. From this high point, c. 240m above the visitor centre, you can see all of Pallas's lakes and fells as well as the ruins of the hold Pallas hotel. This is a place at once steeped in a bygone era and also still thriving as a business. From there, the trail travels east through an old reindeer fence. Camping is permitted near to an old hut that you will find along the trail. It is worth noting that this is one of the trails in the Pallas area along which you will find environmental art - in this case, seven bronze squirrels which embody the world's great religions and the oneness of creation. The 3km Vatikuru Nature Trail begins at Pallastunturi Visitor Centre, is marked by cone signs, and winds around the slopes of Pallastunturi, presenting the life and culture of the region along the way. During winter, visitors can take the unmarked 3-km Pallas Ski and Snowshoe Trail and learn about winter and about how nature adapts to these extreme conditions. A so-far little-used trail which has been recently remarked, leads from the Pallastunturi Fells, via Lommoltunturi Fell, south towards the Yllästunturi Fells. One access point is Rauhala but there are no service structures between there and Yllästunturi, and there are also some restricted areas along the route (entry into which is strictly forbidden in summer). Hence, this is recommended only for experienced hikers. Ylläs-Rauhala-Pallas Trail (72 km) will take you to the beautiful landscape, woodland surroundings and across hills. You can start the route either at Yllästunturi Visitor Centre Kellokas in Ylläs or Pallas Visitor Centre in Pallas. When you leave Kellokas descend first through Varkaankuru Ravine along Lake Kesänkijärvi. Wander through the western end of the lake on the west side of the Kesänkitunturi Fell to Hangaskuru Ravine. Continue past the Hangaskuru lean-to shelter to Kotamaja in Kolmentunturin kuru Ravine, which operates during the winter season as a café. Turn from Kotamaja to the northwest and pass between Pyhätunturi Fell and Kukastunturi Fell to the shore of the River Äkäsjoki. From there hikers travel beside the river northward first passing Lake Äkässaivo and then Peurakaltio Spring. From the spring hikers continue north across the top of Äkäskero Fell. After this hikers pass the Mustakero, Kolvakero, and Kesälaki Fells on the east-side of Lake Äkäsjärvi to arrive in the village of Rauhala, which is on the eastern shore of Lake Jerisjärvi. Please note that the Äkäskero-Rauhala route is a fair distance and route markings are sometimes incomplete. You will need to bring a tent, as there are huts only at Pahtavuoma and Kutujärvi. Also, access to water is few and far between. From the village hikers move north first along the lower slopes of fells and after Anuntinvuoma moving higher up to Koivakero Fell and onto Mustakero Fell on the east-side of Lake Keimiöjärvi. At the hill there is an open wilderness hut after which hikers follow the western slope of Lommoltunturi Fell towards the Pallastunturi Fells. Lengths of the sections of these trails: Ylläs-Rauhala 50 km, Rauhala-Pallas 22 km. You can identify the route with orange paint markings. A very popular trail called Varkaankuru Trail (Wizard´s Trail) begins at Kellokas Visitor Centre. The trail is 4-km-long and leads you through Varkaankuru Ravine. At Kellokas visitors can also get onto Kiirunankieppi Trail (12 km), which circles Keskisenlaki Fell in Ylläs, and Seitakierros Trail (9 km). A 17-km-long trekking nature trail at Aakenustunturi Fell has exhibits on the area’s animals, geology and history. Aakenustunturi hiking trail (17 km): The signposts on the trail introduce hikers to the local fauna, geology and history. The trail starts in the parking lot. Kirunankieppi Trail (15 km): The trail will acquaint you with the geology of the area. The nature trail can be started either in the yard or the Nature Centre Kellokas Ylläsjärvi ski area. It circulates in the rugged mountain terrain of Ylläs with a score of easy-to-walk wooden boardwalks. The path can be recognized by signs with a ptarmigan footprint, seeing as the trail is named after the ptarmigan (Finnish word kiiruna). Lalvajärvi Joutsenpolku trail (6 km) explores the distinctive characteristics of the area including birds, mammals and fish. Located in the middle of the path, at Lalvajärvi bird-watching tower people have observed more than 80 species of birds. The trail starts in the parking TOTOVAARA and is marked with a swan (Joutsenpolku literally means Swan trail). The volcano park's nature trail (1.5 miles) explores the volcanic history of the area, where you'll notice that the reports of Lapland's ancient volcanoes are true. The bedrock of Linkupalo tells geological tales about the volcanic eruptions that occurred over 2 billion years ago. The trail begins at Aakenuksentie, Linkupalo and is marked with red paint. Niesakero nature trail (2.7 miles) starts at Luosu, Niesakero. This nature trail that passes through the varied landscapes of Niesakero acquaints you with the old hunter-gatherer culture and practical game husbandry. Services: shelter, fire making, water supply point. Ylläslompolo nature trail (3 km), passing through the old spruce forest to a small beautiful wilderness lake and meadow will introduce you to the meadow culture, old forests and wetlands. The trail starts in the parking lot of Ylläslompolo and is partly on wooden boardwalks. It is built by the Lapland Centre for Economic Development, and is marked by stakes. From Ylläsjärvi the trail starts at the bird watching tower. Services: trail hut, bird watching tower that is wheelchair accessible. Seitakierros Trail (9 km) is a culture-themed trail that tells the traveller about the northern people's relationship with nature and their world view. The trail starts in Nature Centre Kellokas and rotates around the Kellostapuli fell. Services: shelter and campfire site. Saalistusjotos Trail (5 km) explains the chase and the struggle between predators and prey as well as the methods that nature has developed for survival. The trail begins on the south side of the Yllästunturi with a parking lot and is marked by paw prints. Tähtipolku Trail (8 km) passes through Kesänkitunturi terrain and guides the wanderer to observe the northern sky. Along the trail signs discuss celestial tales. Tähtipolku (star trail) starts from the parking lot of Kesänkijärvi and passes through Pirunkuru Ravine, Kesänkitunturi fell and Tahkokuru Ravine. Pirunkuru Ravine is very rugged and steep, and hence not recommended for beginners. You can identify the path with star signs. Services: two lean-to shelters, campfire site. Hillapolku Trail (6 km) encircles Lake Kesänkijärvi. The trail is easy to walk and smooth, and it is easy to get around by following the signs of the cloudberry. You will also be introduced to the plant kingdom of Ylläs. Saivonkierros Trail (3 km) passes through Äkäsjoki River and Äkässaivo scenery, guiding you through the historical sites as well as following the traditional peasant culture associated with the lime kilns and meadow hay barn. The nature trail signs tell of historic sites in addition to forest, nature, and fishing. It starts on Aakenuksentie road and is marked by wooden poles with Saivonkierros sign. You can start the Ylläs-Levi (47 km) from the Yllästunturi Kellokas Nature Centre or the village of Kittila (Sirkka). When you leave Kellokas descend first through the Varkaankuru Ravine along the shores of Lake Kesänkijärvi. Wander through the western end of the lake on the west side of the Kesänkitunturi Fell to Hangaskuru Ravine. Continue towards the Hangaskuru shelter via Kolmentunturin kuru Ravine to Kotamaja, where there is a cafe in winter. Continue from Kotamaja through the ravine between fells Lainio and Pyhätunturi to the southern end of Lake Pyhäjärvi to an open wilderness hut. The Lake Pyhäjärvi route runs along the foothills of Aakenustunturi Fell to the Äkäslompolo-Kittila road. After crossing the bridge over Aakenusjoki River then arrive at a gravel road along the shore of Lake Aakenusjärvi. Continue from there through Homevaara Fell to the day hut at Muusa. The last end of the journey is through the north area of Pyhätunturi Fell and Kätkätunturi Fell to the wooded landscape of Sirkka village. The trail and path intersections are marked with orange coloured markings. Wooden boardwalks cover the marshy areas. Services: Muusa and Pyhäjärvi Day trip huts, lean-to hut Hangaskuru, Aakenusjärvi hut, Kotamaja hut with cafe open in winter. Ylläs-Olos Trail (69 km) can go either from Yllästunturi Nature Centre Kellokas or Olostunturi ski resort. When starting from Kellokas first pass Ylläs-Levi Trail to Kotamaja cabin. Turn from Kotamaja to the northwest and pass between Pyhätunturi Fell and Kukastunturi Fell to the shore of River Äkäsjoki. From there continue beside the river northward, first passing Lake Äkässaivo and then Peurakaltio Spring. From the spring pass the west-side of Äkäskero Fell to Äkäsmylly Mill. The mill's café is open in winter for peak season. After crossing the Äkäslompolo-Muotkavaara road continue through forest. For the final part, journey to the open wilderness huts at Juuvanrova and Kuusikonmaa and by the north-side of Olostunturi Fell to its end at Olos ski resort. A relatively hidden gem at the southern end of the Pallas-Yllästunturi National Park is the Pakasaivo 'Saivo' / ravine Lake which essentially looks like a crater lake. It is a fascinating geological formation with unique natural beauty and, as such, is a hiking destination with strong mythological traditions. It is situated in a completely out-of-the-way location in the middle of the forest between Muonio, Kollari and Ylläs and you have to reach it down unpaved roads which are nevertheless accessible in most cars. Both the lake and the nearby Kirkkopahta seida rock are ancient Sámi holy places. According to Samuli Paulaharju:1922 (Lapin muisteluksia [“Memoirs from Lapland”], “The most peculiar waters in Lapland are the saivo lakes - these wondrous lakes could only exist in Lapland, the land of wonders. Saivo lakes are closed-off fell and ravine lakes that have no kind of stream running to or from them. From time immemorial, ancient men and their forefathers have dwelled here, respecting and wondering at the handsome Pakasaivo lake and going to worship at the large Seitapahta behind the lake. Seitapahta is also known as Kirkkopahta, as it has been a church of sorts for the people of Lapland.” (Seitoja ja seidan palvontaa [“Seida places and seida worship”], 1932). This narrow one-kilometre-long lake was formed in a rupture valley moulded and cleaned by the melting waters of the ice sheet. The northern end of the lake is remarkably round and regular in shape, and it is considered the largest giant’s kettle in Finland. Pakasaivo, also known as the “Hell of Lapland,” is 60 metres at its deepest, and the steep cliff walls surrounding the lake reach up to 60 metres above water level. The ravine lake is the second deepest body of water in Northern Finland after Lake Inarijärvi. People used to believe saivo lakes to have two bottoms, with the fish sometimes disappearing to the lower waters. The place of worship at Pakasaivo was most likely located on the rugged cliffs off the eastern shore of the northern end of the lake. There are small caverns in the eastern wall of the ravine, which have possibly served as sacrificial caves. The Kirkkopahta rock near Pakasaivo is a lone large boulder in an otherwise even-floored pine heath. The Pakasaivo and Kirkkopahta relic areas rank amongst Finland’s cultural environments of national significance. The Pakasaivo protected forest area, 325 ha, and the Seitapahta recreational forest area, 8 ha are both managed by Metsähallitus and visitors to the Pakasaivo area should follow marked routes when hiking in the area. Damaging the relics is strictly forbidden. In a nearby area, to the north of Äkäslompolo, there is another well-known Sámi holy place, Lake Äkässaivo with its Seitapahta seida rock. Next to the Pakasaivo parking area, there are some Lapp 'kota' huts with a campfire site. The area also has a dry toilet. The larger Lapp 'kota' hut serves as a café in summer. There is a signpost with information about the destination in Finnish, Swedish and English. A roughly 200-metre-long wide wheelchair- and pram-accessible trail leads to the lookout point on the shores of Pakasaivo. Viewing platforms and connecting stairways have been built on the verge of the ravine. Roughly one kilometre to the west from Pakasaivo, on the shores of Lake Pakajärvi, there is a scenic steep-hilled ridge. The northern shore of the lake used to house the dwelling of the local Suikki Sámi family. You can visit Pakasaivo and Kirkkopahta mainly from spring to autumn when there is no snow on the ground, as the forest road leading to Pakasaivo is not ploughed regularly in winter. During the winter months, Pakasaivo is accessible via a snowmobile route. There are no personnel in the area. Pakasaivo is located c. 25km from Äkäslompolo, 40km from Kolari, c. 67km from Kittilä and c. 80km from Muonio. The distance to Kirkkopahta is a few kilometres shorter. There are signposts leading from the main road to the Pakasaivo parking area. Driving from Kolari along road no. 21 (E8), take the Äkäslompolontie road (no. 940) roughly 10 km north of the village centre and drive almost all the way to Hannukainen. At Hannukainen, turn northwest onto the Pakasaivontie road and continue for roughly 13 km. There are signposts along the road, and at Pakasaivo, the road veers to the left towards the parking area. Driving from Kittilä, take the Ylläsjärvi-Kolari road (no. 939) immediately after the village centre. After Ylläsjärvi village, take the road leading to Hannukainen (no. 9404). As you reach the Kolari-Äkäslompolo road, turn left and then, after 700 metres, right onto the Pakasaivontie road. For the rest of the way, please see above. Driving along the Muonio-Kittilä road (no. 79), take the Äkäslompolontie road (no. 940) at Muotkavaara. Drive through Äkäslompolo village and 1 km past Hannukainen. For the rest of the way, please see above. Pakasaivo is located along the snowmobile route south of Muonio. The destination is accessible from Äkäslompolo, Ylläsjärvi, the Muonionjoki River, Kolari, Kittilä and Muonio. You do not need a permit for riding a snowmobile on the routes. To Kirkkopahta: The destination is located along the Pakasaivontie road, less than 3 km before Pakasaivo and some 100 metres off the road. At Kirkkopahta, there is a parking area on the west side of the road. The seida rock is visible from the forest road. The Pakasaivontie road (13 km) off Hannukainen is not ploughed regularly in winter!